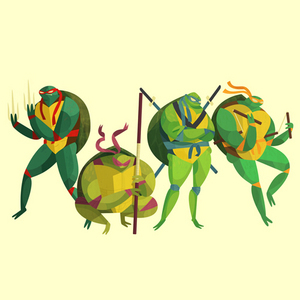 Gallery Nucleus and Nickelodeon Studios are proud to present an official art exhibition in honor of the Teenage Mutant Ninja Turtles' 30th Anniversary. Join us as over 30 artists pay tribute to the Teenage Mutant Ninja Turtles with art from their numerous incarnations alongside work from some of our gallery favorites, who'll be bringing their own unique take to the series. See character, background, storyboards, and other development art by the creatives behind the new TMNT series. Also on display will be an assortment of TMNT memorabilia. TMNT costumes and attire encouraged! Open to Public, All Ages Welcome, No RSVP needed. Free refreshments and TMNT mocktails available. © 2014 Viacom International Inc. All rights reserved. Nickelodeon, Teenage Mutant Ninja Turtles and all related titles, logos and characters are trademarks of Viacom International Inc. Teenage Mutant Ninja Turtles created by Kevin Eastman and Peter Laird.